I started the New Year off with a trip to Israel and Palestine through the Cohen Hillel at the University of Illinois at Urbana-Champaign. I heard about it through a friend who works at the center and found out it was all expenses paid. It was an 8 day Leadership Delegation with other students from U of I. We left on January 2nd and started in Tel Aviv. Over the course of the 8 days, we’d travel to Jerusalem, the West Bank and Ramallah, Gaza Strip, Nahariya, Givat Haviva, Mount Herzel, Golan Heights, and Kiryat Gat. Israel and Palestine are the most beautiful locations I have ever been to. Just driving from city to city and seeing landscapes of mountains, valleys, and terrains. There’s no question that tourist will begin to traveling at higher numbers in the next decade. In terms of the conflict, I still feel so lost and confused in understanding the root of it and how to make an impact. Each day, we’d meet speakers who would share their experience as an Israeli and just when you feel like your getting a grasp of the conflict you’d meet someone else who shared their experience as a Palestinian. And by the end, you feel confused and left with unanswered questions well because you didn’t even know what questions to ask in the first place. But here’s what I do know for sure. The Israeli and Palestinian governments need to continue developing their economy and have political leaders in office who are serious about the development of their nation. A major take away is that without political representation and a strong economy, a population is weakened and divided. If I could do one thing after the trip, it would be creating museums that solely focus on historical moments of peace and resolution. 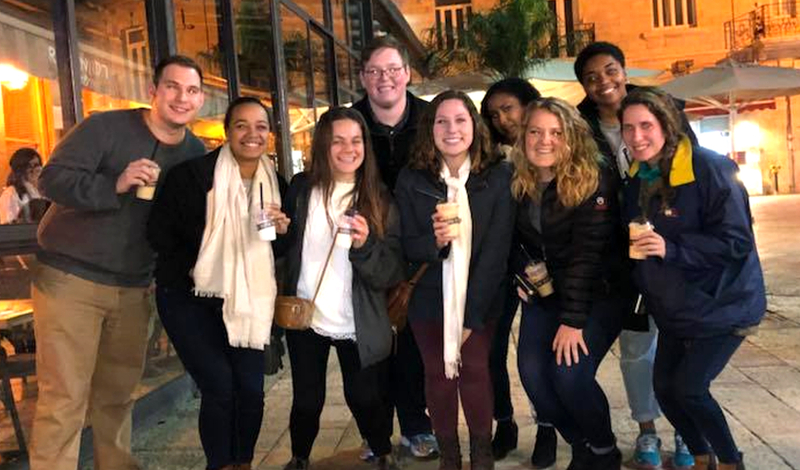 Editor’s Note: Aja Beckham participated in a trip to Israel with University of Illinois at Urbana-Champaign student leaders this winter. Read more by Aja Beckham on her blog.